MIAMI, FL, February 15, 2017 – Oceania Cruises, the world’s leading culinary- and destination-focused cruise line, announced an additional series of journeys to Cuba in the autumn of 2017. Ranging in length from six to thirteen days with departures from Miami in November and December, these voyages include the line’s first calls to Cienfuegos and Santiago de Cuba, in addition to Havana. These new itineraries will open for reservations today, February 15, 2017. Panoramic Caribbean – 10 days from Miami visiting Havana (two days), Roatan, Santo Tomas, Harvest Caye, Costa Maya, and Nassau. Departs November 14th. Timeless Cuba – 7 days from Miami visiting Havana (two days), Cienfuegos, and Santiago de Cuba. Departs December 1st and 8th. Vibrant Vistas – 6 days from Miami visiting Key West, Havana, Cozumel, and Great Stirrup Cay. Departs December 15th. Holidays in the Tropics – 13 days from Miami visiting Key West, Havana (two days), Roatan, Santo Tomas, Harvest Caye, Costa Maya, Cozumel (two days), and Nassau. Departs December 21st. The door to Cuba’s soul, Havana captivates with its larger-than-life culture, sultry rhythms and weathered beauty. 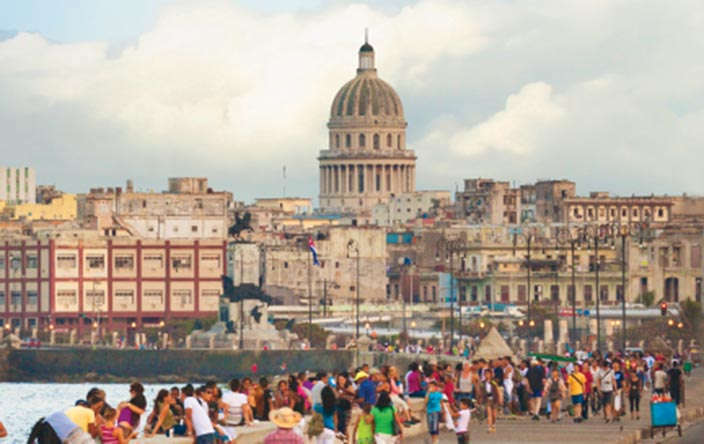 Take a relaxing stroll along the evocative Malecón, the quintessentially Cuban thoroughfare and get lost among the Baroque facades and colonial cobblestone alleys of Old Havana. Visit the grandiose Capitolio Nacional and explore the world-class Cuban art collection at Museo Nacional de Bellas Artes, which showcases everything from colonial-era paintings to countless masterpieces from Cuba’s famed Vanguard Period. Enjoy memorable explorations such as touring one of Havana’s venerable old cigar factories for an inside look at the birthplace of these world-famous cigars and the centuries-old process of how they are made. Situated in a beautiful bay in the heart of Cuba’s fertile agricultural region on the southern coast, Cienfuegos will quietly charm you with its French spirit, tranquil seaside setting and neoclassical architecture. Known as La Perla del Sur (the Pearl of the South), Cienfuegos was originally founded by French settlers and its city center is recognized as a UNESCO World Heritage site. Rich in educationally engaging diversions, its historic center features well-preserved 19th-century structures, gorgeous plazas and a layout inspired by the Spanish Enlightenment. Discover the ornate and eclectic Palacio de Valle and take in the stunning views as you explore Punta Gorda, the perfect spot to enjoy the sunset. Step back in time at Teatro Terry with a performance by local artists or discover nearby Trinidad, a remarkably well-preserved colonial town recognized as a UNESCO World Heritage site and anchored by its impressive Plaza Mayor, an open-air museum of Spanish colonial architecture. Featuring a fleet of intimately luxurious ships, Oceania Cruises offers an unrivaled vacation experience renowned for the finest cuisine at sea and destination-rich itineraries spanning the globe. Seasoned world travelers are drawn to Oceania Cruises’ expertly crafted voyages, which call on more than 370 ports across Europe, Asia, Africa, Australia, New Zealand, the South Pacific and the Americas. Spacious and elegant accommodations aboard the 684-guest Regatta, Insignia, Nautica and Sirena and the 1,250-guest Marina and Riviera invite guests to explore the world in unparalleled comfort and style.